February 19th - Steele open 10am-6pm; branches closed. Patron Appreciation Week - We Love our Library Users! Because we appreciate our loyal patrons, we are setting aside a special time during the week of February 12-17, 2018 to thank you. One lucky library user will win a Library Lovers Prize at each CCLD location. Visit your favorite library or all of them for a chance to win! Monday, February 12 - West Elmira Branch - Snacks will be available throughout the day with a sit down pizza dinner & a show from 5:00-7:00pm. Enjoy the musical entertainment of Kate and Nate and earn an extra entry in the Amazon Echo drawing for attending the program. Tuesday, February 13 - Big Flats Branch - refreshments served all day from 12:00-8:00pm with a special program from 6pm to 7pm. Wednesday, February 14 - Horseheads Library - music by John Manfredi, from 2:00-5:00pm with light refreshments. 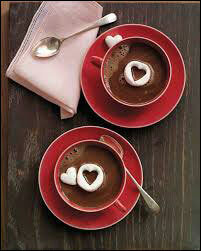 Wednesday, February 14 - Van Etten Branch - enjoy coffee, tea, hot chocolate & sweet treats from 2:00-6:00pm. Thursday, February 15 - Steele Memorial Library - enjoy candy kisses all day, and a lip balm giveaway while supplies last! Musical entertainment will be provided in our cafe area by our very talented staff Stuart Finch and Sue Schoeffler from 2pm until 4pm. Light refreshments will be served. Remember to enter your name for our giveaway - a $50 gift card to The Green Derby! Drawing to be held on Friday, February 16. In order for the Bookmobile to reach all their patrons, Kim will hold Patron Appreciation from February 5-16. Visiting school children will play the M&M's game and receive stickers. To schedule a training session for one of our certification classes (see below), please call 607-733-6809 during the Tinker Lab's open hours, or E-mail us at: labcentral@stls.org. Become certified to use the Digital Media Lab - Learn how to record a video, edit the video and use a green screen to add background effects. You must have a parent present if you are under 16. Once you have completed the certification class, you can use the Digital Media Lab at Steele independently. Become certified in the use of the 3D printers at the Steele Memorial Library Makerspace. Learn how to change filament in the printers, navigate the display menus, and utilize the slicer software for optimizing your 3D prints. Completion of the certification process will allow you to use the 3D printers independently. Anyone under the age of 16 will be supervised in the use of the 3D printer. Patron Appreciation Day at Steele will take place on Thursday, February 15th. More details are available above (top of the newsletter). "New Year, New You!" - Tai Chi and Ultimate Fit Chick classes continue this month! See the schedule below for dates and times. Our second class in the "Hometown Art" series with Wynn Yarrow is on February 12th at 6:30pm. The local inspiration for this month's class is the library! Choose a character from among your favorite books. 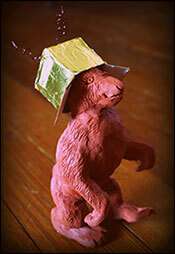 Use your imagination and the author's descriptions to manifest the character in air-dried clay. This class is intended for adults and teens. Registration is required: 733-9175. Performer Tim Collins will be here doing a special performance "Standing By, Standing Up" during Teen Safe Zones on Wednesday, February 21, 6:30pm. His interactive show tackles cyberbullying, exclusion, and how to stop bullying as a bystander. All teens welcome! Light Refreshments. Teens & Relationships: Teens, what is important to you in a healthy relationship, whether it is a romance, friendship or with a family member? Find out through games, discussion, and fun activities during our teen nights in February. Snacks and prizes! February 7 & 21, 2:30pm - Teen/Tween Homeschool Group (ages 11-18) Topics: 2/7 - Doing research (without Google). 2/21 - Games & snacks. Everyone is welcome (volunteer credit available). February 16, 6:30pm - So Bad, It’s Good Movie Night - Movie: Dudes & Dragons (Adults & Teens) Snacks! Mock the movie out loud with us. Celebrate Mardi Gras on Tuesday February 13th with a craft and a movie. 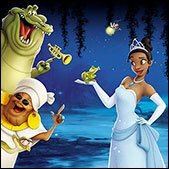 The Princess and the Frog, is set in the great city of New Orleans, with a modern twist on a classic tale, featuring a beautiful girl named Tiana, a frog prince who desperately wants to be human again, and a fateful kiss that leads them both on a hilarious adventure through the mystical bayous of Louisiana. Big Flats Library LOVES our patrons so much that we are having a day dedicated just to you! On Tuesday, February 13, Big Flats Library will be holding Patron Appreciation Day! Stop in and say hi, have some refreshments and if you are lucky enough to reserve your spot for the stuffed animal program, stay and have some fun with us too. We will be holding a raffle for a special prize and all you have to do is stop in and register. It will be a fun day dedicated to you: our great patrons. On February 13, Noah’s Ark Teddy Workshop returns for another fun evening of stories and bringing Pigsley Pig to life. This workshop is similar in nature to Build-A-Bear. Pigsley will be the perfect addition to your child’s personal zoo. Registration is required due to space. Call 562-3300 to register. Patron Appreciation week: Due to our 2 week schedule, we will be celebrating from February 5th to February 16th. There will be M&M's, from the M&M's dispenser, bookmarks, and stickers. There will be a drawing for a $50 gift card of winner’s choice. Stop in a grab a book for a chance to win. Our book club meets the 2nd Friday of the month at the Bulkhead stop in Southport at 1:30pm. For the month of January we read "I let you go" by Clare Mackintosh, to be discussed on February 9th. Next we will read "The Heirs" by Susan Rieger to discuss in March. 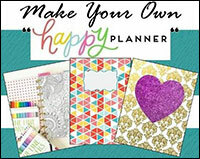 In February at Horseheads, start your New Year right by joining us for a two-part series to create & personalize a planner to organize for your future. Also, there are a few spots left in our Animal Communication class. Join us on Valentine’s Day for an afternoon of music by John Manfredi to celebrate Patron Appreciation day! Sign up to learn all about your tablet or smartphone! Registration is required for all programs. Call 739-4581 to register. Once Upon A Time...Short Story Contest - To celebrate "Tell a Fairy Tale Day," we are inviting teens to create their own original fairy tale! Entries should be 12 point font, double-spaced, and 3 to 6 pages long. DEADLINE FOR ENTRIES: Saturday, 2/24. Submit in person, or email to leep@stls.org. Winner will be notified by Wednesday, 2/28. It’s cold outside, so warm up with us in the library! Make a craft for Valentine’s Day, Mardi Gras, or Chinese New Year at our Craft Night program! Register to read to a cat for kitty lit (grades 1-6 only)! Don’t forget Lego Club! February 20, 2pm - No School Movie: "Lego Ninjago"
February 14 is our annual Patron Appreciation Day from 2:00-6:00pm. Come in from the cold and enjoy coffee, hot cocoa, tea & some sweet treats. Also, enter the Van Etten drawing for a chance to win a $50 gift card for a local retailer of your choice! This month’s LEGO Challenge is "Winter Olympics"; Your LEGO creation can be any type of Olympic sporting event! Come join the LEGO fun! February 2, 3:30-4:30pm - Celebrate Ground Hog Day! Visit us the week of February 12-16 as we celebrate Patron Appreciation week. Each time you checkout this week, you get an entry into our drawing for an Amazon Echo. All day on Monday, the 12th, we will have refreshments available and a special program at 5pm to show our appreciation for our wonderful patrons! Last Monday of every month, 6pm - Family Movie Night - Pokemon the Movie: I Choose You! This is Jeopardy! Or, How Do People Actually Get On That Show?